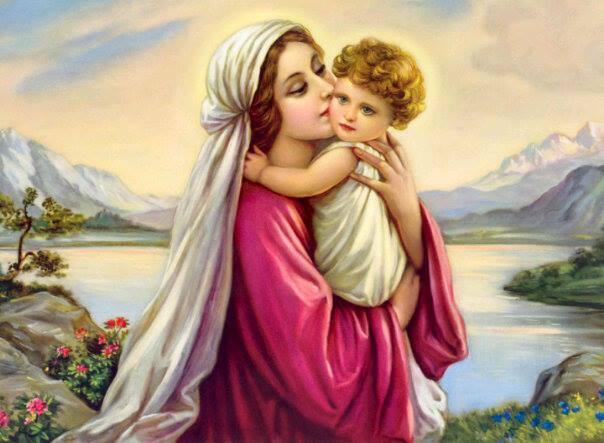 Today is Mother Mary's birthday. She is referred as the most compassionate, most loving, virgin Mother because of Her high chastity and purity while in Her human embodiment, who was the instrument to bring a great Master - loving Jesus Christ on the earth plane. Almost a large part of my life, I carried Mother Mary's loving picture with me, especially school days, where I had stuck Her photo in my instrument (compass) box, so that I could see Her every time I opened the box. This was a mystical picture because it was already used by my aunt during her schooling and then I used it throughout my school till 10th. Never did it's color even fade. She was the first I spoke to after I woke up and had the last whispered conversation before I went to sleep. She is the most beautiful loving form of divine love I have always experienced. In earth history, there were many times she appeared at various places to give the ones who earnestly prayed to her what they needed, especially protection, health and life. One of such places was Velankanni, Tamil Nadu, where she appeared to a poor lame boy who sold buttermilk who walked after that. Since then this place has been a miracle place for lakhs of people across all faiths who visit there. September 8th is the day when even more people gather to celebrate this day, to pray for healings and to offer gratitude. On this opportunity, i would like to share something mystical that happened during my last 15-day travel in May 2013 to various Siddha (Yogis who are perfected beings) locations. This travel was focused solely on meditating in those sacred locations that included jungles, hills, caves, etc and it covered more than 3000+ kms from New Delhi to places in Karnataka to Tamilnadu and into Andhra Pradesh and back to Delhi. Everything went perfectly as planned and we were perfectly "guided" and protected all through the difficult terrains and paths. 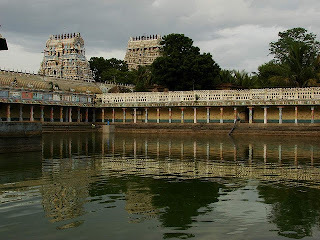 While we were in Tamilnadu, we were to proceed towards a place called Vaideeshwran Koil, the place of the Siddha Nadi Shastra Vigyan, but we found ourselves only 40 kms away from Velankanni and i felt eager to go there. i had been there once before and i knew it was a powerful place but i hesitated my friends may not like to go there. 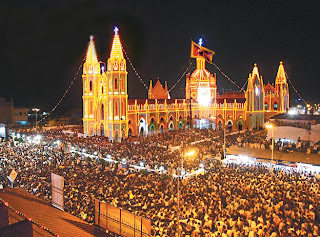 To my surprise, when i mentioned that we were close to Velankanni, they knew about this place and expressed their eagerness to go there and we changed our direction of travel. We three practised the spiritual practices of one Master, our Guru. This was the first time i came to this place after the spiritual practices i did and this time, sensitive to energy that our Master had made us, the energy in the church and around could be experienced physically and subtly. We prayed and meditated in the church, kneeling down, a symbol of surrender of ego. What a beautiful blend of religion it felt, though for me and my friends there was nothing different or varying from the deep meditational experiences we could have at a so-called Hindu sacred location or a Sikh or a Christian sacred place. We visited the various holy spots in the vicinity of the church. I recited the prayers of the Mother all around and even the mantra of Shakti, the feminine. It was a great experience and such a beautiful feeling and deep down or you may call high up there, there are no religions; for the divine it is all your energy and your pure intentions in everything you do. Then, we continued to our pre-planned destination - Vaideeshwaran Koil, a place that is known to hold the sacred knowing of Nadi Shastra Vigyan, since thousands of years when to the time of ancient Yogis, who wrote the destiny of each and every human being on palm leaves. They sound very superstitious or religious but are none, but a deep science. The ancient Yogis of India were the greatest scientist who had even known about gravitation, solar science, about the Universe, astrology, and other mysteries without scientific instruments but their powerful meditational practices. They traveled the entire globe without vehicles but their mystical powers. But with time everything that they had given to the world adulterated or eventually vanished owing to the selfish motives of human beings. The Nadi Shastra was one such very rare science available in this part of India, that were passed down from the Yogi's generations to generations, of course, it remains with very few genuine people, rest operate with various other motives. Here, only your date of birth and thumb impression is taken and the rest is revealed by the expert. I was wanting to test this out that i always used to hear from my master, who himself is from the Yogic tradition, and was curious to know it's authenticity. So, this time, this place was also on our charts. After our meditation at a certain Yogi's location, we were "guided" to a Nadi Shastra expert. I found nothing superstitious there, as he took my birth date and thumb impression. The thumb impression is taken to check certain mounds that reveals lot of data. He went in and brought a set of selected dry palm leaves that looked thousands of years old. He asked me questions to which I was to only answer with yes or no. While I did that, I saw him shuffling the palm leaves and finally arranging a set of leaves while the rest he pushed aside. You could call it a science of permutation and combinations. Then, a few more questions, and some more leaves were removed and then he sat with the final set of palm leaves. The full reading would take about 1-1/2 hours and a general one 1/2 hour and i had opted for general because of lack of time. He then began revealing my own name, my family members' name including my siblings, the life incidents that I and my family went through, the people I lost in life, my current situations, my current profession, my past lives and what karma from previous life brought me the current circumstances, the future status of me with the people i am related to in this life time. I sat there acknowledging but not excited over these things because my Master was clear at all times that the future can be predicted through this or astrology or palmistry or other sciences but humans always have the power to change it with sadhna (spiritual practices) because he always told that every incident sprouts from our past Karmas (deeds) and our current karmas predecide our future life incidents, thus, by changing the present karmas, the future can always be changed. If nothing is done at present and one lives life as it is then the destiny would take shape according to these predestined routes that are nothing but only the laws of creation - the cause and effect, what Jesus said "What you sow, so shall you reap", which other religions call Karma. Anyways, my intention here was not to speak of this but to show how deeply everything is connected and there is nothing called religion actually. So, coming to the point, during the reading, he suddenly mentioned about Velankanni and a sadhna I would need to do there as it was linked to my past and this life and here I was zapped because I had come from Velankanni itself. He told me it's relevance and i would very much understand and co-relate it to what it was in my life that he was relating to. After giving more insights, he closed the reading with the last mention of the age i would leave my body. He looked at me if I had any questions and reading my non-reaction to any of his reading he assumed that i was not believing in what he said, especially because i was a Christian. i thanked him quickly, paid him his fees and left with a smile on my face, amazed at this great science and the words of the my master and the powers of the Yogis. Word of caution: In Nadi shastra there are thousands of nadi experts there with open shops and not all are necessarily genuine. Wrong readings and digging into future through these forms can have adverse effects on human minds. Even what could have been changed with sadhna, one can actually manifest it if one does not look at all this from a different level of consciousness. Imagine someone telling everything accurately and then says you die on this day or certain thing will happen on this day. One who is not prepared for this will linger in this and create it for themselves though there were chances of them changing that event by spiritual practices. Moreover, even if the readings may be accurate to convince you, still there are chances of manipulation in it somewhere or the other for various motives, mainly money. 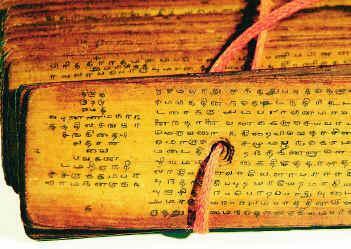 Though all sorts of people go for Nadi Shastra readings, I would never recommend it unless the purpose of it is for the higher and purer purposes. And if one is aligned for such purposes, then one will surely be guided to the right person, IF that is for one's highest good. I deliberately put this experience to focus on the fact that there is nothing called religion, everything is one, God is one, His ways are many, His forms are many. All are reaching the same Supreme power through any path or religion. I agree with you Jacob. Happy Birthday Mother.